If you can’t have an outdoor grill, either because you don’t have a place for it, or your landlord won’t allow one because of justifiable fire concerns, or if, like us, there are only 2 of you, you might find an indoor contact grill is for you. We love ours. Contact grills have a top and bottom grill plate and close over the food to cook both sides at once. The advantage of a folding contact grill is that they cook on both sides simultaneously and require less attention from the cook. They also contain grease spatters and mess. My favorite is a 4 serving George Foreman grill with removable plates that I only paid $30 for. It heats quickly, cooks very well, is easy to clean, and has a floating hinge so your food isn’t squashed. My Panini grill didn’t have the floating hinge, and limited me to just sandwiches or open grilling. The biggest drawback...their idea of 4 servings is more adequate for 2, which works for us. If you actually need 4 servings, look at a little bigger version, there are several. The advantages, at that price, I can afford to replace it if we wear it out, we have no grease floating around the kitchen when I cook, and the speed is unbelievable. It's much faster than the one I bought when they first became popular, and removable plates are a big improvement; they can be washed in the dishwasher if you wish. We use it at least once or twice a week. 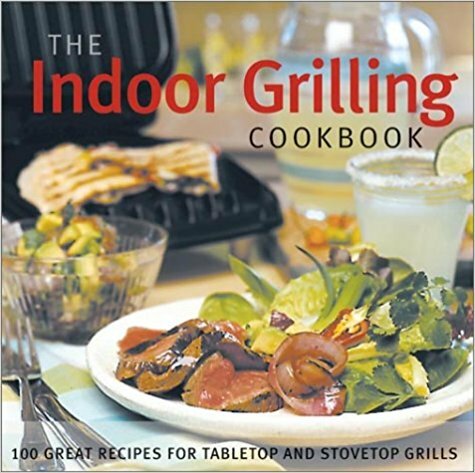 So what can you grill on your indoor grill? Most anything you would outside. Indoor grills don't have the ability to drain liquids as well as outdoor grills and you don't want marinades running over your counter, so when grilling marinated meats allow them to drain first, although there is a liquid-catching tray that comes with the grill. To get delicious grilled flavor from protein like meat, poultry, fish, it's important to start with the right type of cut. Lean, tender pieces that aren't full of fat or connective tissue are the best choices. You'll get the best results from thinner pieces of meat, such as flank steak, pork chops or chicken breasts that have been pounded to around 3/4 inches, or thin fish fillets like tilapia or trout. The reason? The thinner the piece, the faster it'll cook. It's also helpful if the meat is relatively uniform in its thickness so that it will cook evenly. Because you're not going to be getting the smoky flavor you would from a charcoal grill, you'll want to season your meat. A simple sprinkling of salt and pepper is fine, but we like buying or making a spice rub. Evenly sprinkle or rub this into the meat and let it sit a few minutes before putting it on the grill. You could also use a barbecue, grilling sauce, or marinade, which can be applied about 20 minutes before you're ready to cook. The easiest way to marinate meat is to put the meat and the marinade in a large zip-top bag and maneuver it around with your fingers so that the meat is evenly coated. Store the bag of meat in the refrigerator while it's marinating, but bring it out about 20 minutes before you're ready to start cooking so it can come up to room temperature. Make sure the grill is well heated before you put the meat on. I let my George Foreman grill preheat 5-6 minutes. Put your meat on the grill, at a roughly 45˚ angle to the grill lines to achieve the most attractive grill marks. I prefer testing my meat it with a food thermometer, and consulting a list of safe food temperatures to make sure cooked to a proper temperature. If you're using a contact grill, be sure to close the grill gently over the food so you don't compress it and risk squeezing the juices out. Foods cooked in a contact grill will take roughly half the amount of time they'd take on an open grill, since they are being cooked simultaneously on both sides, and also since the heat is more enclosed within the top and bottom grill plates. To clean my contact grill, I lay 3 or 4 layers of very wet paper towels between the plates, and let them soak while we eat our meal. I simply remove the towels and wash the plates in a little sudsy water in the sink; letting them dry thoroughly before snapping them back into the grill. They can be washed in the dishwasher, but I want to prolong the finish as long as I can. My grill directions specifically say to avoid cooking sprays on the grill plates, because they cause a gummy residue you can’t remove. Use non-metal tongs or spatulas to help preserve the non-stick finish. I found I like this small hardcover cookbook to use with my grill more than others I looked at, called The Indoor Grilling Cookbook. It's by Julie Stillman, from 2001. I purchased it inexpensively used. Here’s my husband’s favorite Foreman grill recipe…because the sandwiches are gooey in the middle, and the bread is crisp on the outside. I recommend a firm bread for these sandwiches…homemade is great! Preheat your Foreman Grill for at least 5 minutes. Use medium-high setting if your grill has temperature settings. Place the cheese between the bread slices and spread the butter on the outside of each slice in a nice thin layer. Place on the grill, close lid, and check after about 3 minutes. We have a panini press and went thru a spell of using it all the time. I like my sandwiches crisp and toasty.